5 + Bedrooms, 5 queen beds, 2 bunk beds, 3 futons & more. 4 Baths, Sleeps 4-16. Wakeboard, ski or tube on beautiful Bull Shoals Lake - 1000 miles of shoreline and always an open cove for your boating and water fun. We have a gorgeous swim and boat dock with 4 slips for your boats or jetskis. Put your boat in at the nearby 125 Marina and keep your trailers on our 72 acre resort. Treat your family to a truly unique vacation that allows togetherness but also space to get away from the crowd for sleeping under separate roofs - over 5200 sf under roof available. Our spacious 1000 sf Lodge offers spectacular views of the lake, Brunswick Vintage Pool Table, dining tables for Large group meals and sofas or chairs for relaxation and is open 24/7 for your family to gather. New in 2019 is guest access to the laundry room! We also have 3 unique cottages and bunkhouse for sleeping with more privacy than having everyone in one house. There's a treehouse, disc golf, horseshoes, complementary baking lessons plus included homemade bread, ice cream & desserts. We would love to host your family getaway here on this clean open lake - perfect for water fun and teaching everyone to ski or wakeboard with no worries about others getting too close. Trimble Creek Lodge is a resort with the privacy of a Vacation Home, the extras of a Country Inn and the adventure of a 72-acre wilderness-location peninsula on beautiful Bull Shoals Lake. We offer one-of-a-kind vacation experiences for families, reunions and groups of 8-16 in a rustic upscale set-up that includes: A spacious Lodge for gathering, three unique and charming, fully equipped cottages, plus private boat & swim dock, bunkhouse, treehouse, disc golf course and horse shoe pits. We reserve the whole place to one group at a time so you would have sole access to the Lodge, cottages and dock during your stay. You will find lovely extras here like great beds, fresh flowers, nice sheets, homemade desserts & breads and on-site innkeepers. We live in a cottage attached to the West side of the Lodge, but you cook for yourselves in your kitchens with options to purchase additional home baked breads or desserts. One reason our place is great for families and reunions is our Lodge Common Space – an airy room with cathedral ceilings, plank oak floors and fabulous views overlooking the lake where you can gather day or night for games, conversations, or group meals. Then our guests move to our three cottages for greater sleeping and showering privacy. The mile-long cove where our private dock is situated is not crowded and perfect for skiing, wakeboarding and swimming. In fact some days you will be the only boat in the cove. On Google Earth, find us at the end of the Trimble Creek cove of Bull Shoals Lake – we are the entire peninsula there. All getaways include many extras including use of free boat slips, stand-up paddleboards and kayaks for the week. In addition we offer Two Free Family Style Desserts or Breads – all homemade here at TCL. Enjoy a hand-churned ice cream event with your family complements of us. Or, try a batch of our TCL Crusty Home-made rolls and Lecy’s brownies, one of our cobblers or carrot cakes to celebrate a birthday or anniversary. Optional Free baking lessons from Lulu, the TCL Cook are fun and popular here among cooks of all ages. Private dock, Wi-Fi and kitchens with everything from coffee to crock-pots make your stay distinctive, simple and relaxed. WHAT MAKES TRIMBLE CREEK LODGE UNIQUE? We, Michael & Lulu, are your Innkeepers during your stay at Trimble Creek Lodge. We personalize for each of our groups. Homemade ice cream, double chocolate brownies, free baking lessons and help celebrating a special occasion, birthday or anniversary are some of our unique offerings. Every vacation here includes at least one free family style food gift from our Trimble Creek Lodge favorites including our own hand churned ice cream, double chocolate brownies or fabulous crusty fresh baked baguettes. Spend time together in the Lodge, on the dock or at one of the many porches throughout our resort. Then, spread out for sleeping in our 3 stand-alone cottages plus the bunkhouse. We have a gas grill and provide most everything you need in our kitchens (waffle irons, crock pots, good knives, rolling pins, great pots, plenty of dishes and a dishwasher in the East Cottage), bathrooms and bedrooms (fluffy towels, high quality sheets we iron by hand for you, beautiful quilts, fresh flowers and American & English soaps). Bring your food and friends and you are set! Bull Shoals has 1,000 acres of shoreline and the water is beautifully clean. Guests love swimming or just relaxing off our swim dock and enjoying the seclusion of our beautiful natural location. This lake is so large, you can boat or water ski without getting close to other boats – one of the reasons families love this place. We are located on a 72-acre peninsula in a wilderness area, have a great swim and boat dock with 28-foot slips, electricity, and a fish cleaning station. 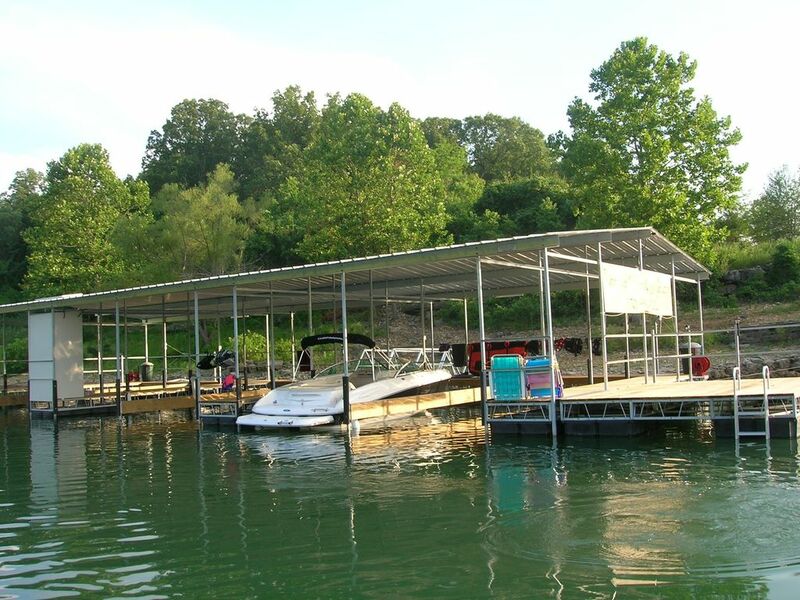 Our dock is for our guests only in a private cove on what many think is the most beautiful lake in the Ozarks. We have slips for your boats or jet skis, and you can also rent watercraft from 2 nearby marinas - 125 Marina or Buck Creek Marina. We also have 2 Kayaks, 2 youth size Stand Up Paddle Boards and a Jon boat available for our guests to use during their stay here. LODGE An ideal space for all your group gatherings, card games, pool tournaments, and simply spending time with friends and family. This large, airy space houses the library, vintage pool table, family-style dining tables, sofas, chairs, fireplace, hardwood floors, cherry paneling, ceiling fans, Wi-Fi, and a twenty-two foot window wall with spectacular views of the lake and our Heart of the Ozarks hillsides. (We are at 900 feet elevation, the lake at 650). Attached to the East Cottage, and opening to back and front decks complete with grill, a sun deck, a sun-shading pergolas and outdoor furniture, the Lodge is a favorite with all our family reunions for lounging, refreshing, outdoor meals and catching up with those we love in our naturally mosquito-free location. The treehouse, disc golf course, foosball table (porch location) and nearby horseshoe pits provide additional outdoor fun for your group. The Hot Tub Room, a lovely 12 X 12 redwood enclosed room with windows on three sides, houses our hot-tub-for-two and is also attached to the Lodge. About 1200 sf or a combined 2600 sf with the East Cottage. Wi-Fi available. Available all Seasons. EAST COTTAGE Typically the location for joint dinner preparations, the two and a half bedroom East Cottage is fully equipped with kitchen, lake view grill, bathroom, satellite TV, living room, sofas, chairs, air conditioning, linens, fireplace and two fridges for those extra vacation foods. Two queen-sized beds, one queen sofa sleeper and one full-sized futon provide sleeping for 2-6 guests. Attaches directly to the Lodge. About 1400 sf. Wi-Fi. Available all Seasons. MEADOW HOUSE A charming two-bedroom cottage style vacation home provides additional sleeping, kitchen and bathroom spaces for groups using the East Cottage and Lodge. A kitchen, family room, TV, bathroom, linens and air conditioning make the Meadow House perfect for families with younger children, grandparents, or those who enjoy a quiet getaway. A large covered porch provides lovely forest vistas where wild turkey regularly feed over rolling hills. Each bedroom sleeps two in queen beds and the family room also offers sleeping for teens or children on a large sofa and a twin futon. Sleeps 2-6. About 900 sf. Summer Mostly though Spring or Fall Getaways may be possible.. THE BARN AT TRIMBLE CREEK LODGE And Yes! It's really in the Barn! A perfect additional "away from the crowd" sleeping space for a couple. One bedroom with a queen bed, bathroom, family room/kitchen with full sized futon, and lovely views of an oak tree dappled meadow, located between the Meadow House and the Lodge/East Cottage. Located on the ground floor of our barn. Sleeps 2-4. Summer Only. BUNKHOUSE A Separate sleeping space with a view of the forest, is an option for all groups who also rent the Lodge and East Cottage. Located just west of the Lodge, it provides sleeping and adventure for 5-6 tweens or teens in one full size futon and two sets of bunk beds. Guests sleeping in the Bunkhouse come into the Lodge or East Cottage to use a bathroom. Summer Only. SLEEPING SUMMARY East Cottage: Green Room (1 queen), White Room (1 queen), Tile Room (1 double futon). Family Room (1 queen sofa sleeper). Meadow House: Blue Room (1 queen), Pink Room (1 queen), Family Room (1 large sofa & 1 twin futon for teen or child sleeping); Bunkhouse: 1 full futon & 2 sets of bunkbeds; the Barn at Trimble Creek Lodge: 1 queen & 1 full futon; Lodge: everyone for fun, dinner or gathering 24/7 (no beds). SUMMER AVAILABILITY: All Spaces 2-15 guests. SPRING & FALL AVAILABILITY: Lodge & East Cottage Only 2-6 guests. Meadow House by request only. WHAT'S NEARBY? The Buffalo River is not far and lovely for day trips & river floats. The nearby White River is famous for trout fishing. We are only an hour from the shows and shopping in Branson, MO. Harrison, 45 minutes, has great prices on antiques, groceries & restaurants. Or visit Yellville or Flippin for groceries. Eureka Springs is great for upscale boutique shopping & Victorian architecture. The Crystal Bridges Museum of American Art is in Bentonville – both 1.5 hours. Google Arkansas Trails for hiking info. We are honored by the many wonderful families and groups who in the last 15 years have chosen Trimble Creek Lodge for their vacations & getaways. Over the years we created many memories during our own family vacations with our children and extended family & friends. We hope you will do the same during your time here with us in Arkansas, the Natural State. We are fortunate our kids still return “to the Lake.” As a family, we treasure the things that are most different from our daily lives – long and competitive card games, lazy afternoons on the lake, learning new ways to have fun in the water – tubing, skiing, wakeboarding, fishing and making up games of our own! Here at Trimble Creek Lodge we hope you enjoy leaving your normal lives behind and experiencing life in our unique, natural setting where summer days are distinctive, simple and relaxed. Enjoy fixing and eating family breakfasts or dinners when no one is rushed to get to work, soccer or school. Take the time to enjoy a quiet morning outdoors listening to the birds. Have a family story/discussion night and hear everyone’s stories – Grandpa as well as young ones. Instead of going to the gym, enjoy walking or running on the lanes among the cottages & grounds or down to the lake and back. Borrow a book from our library and read it outdoors, on the dock or in one of our cozy nooks. Play games with your kids. Please let us know any questions about Trimble Creek Lodge. We want your vacation to be memorable and we are here to help but not to interfere with your family fun and celebrations. When asked if a group's noisy, late-night celebrations will bother us, we often reply, "In 15 years, no one has never been has loud as our own, wonderful, boisterous family!" Our hope is that your family and friends will build your own memories and vacation traditions here in one of the most pristine, natural environments you will find in all of the US. We vacationed on Bull Shoals Lake for years with own our kids who loved to ski, wakeboard and swim. Because this lake is so clean, large & open, we felt more secure teaching our then quite young children to ski. We didn’t worry about other boats getting too close if the kids fell while skiing or tubing or if we just wanted to stop our boat somewhere and jump out for a cooling swim! We realized there were no places quite like Trimble Creek Lodge on this lake– somewhere families could gather in privacy but with a few more amenities than were typically offered in this region. Our business was born in 2002 with the desire to create a vacation location for families that was distinctive, yet simple and relaxed. The way our own family likes to vacation. As Innkeepers on the property we can offer assistance as well as the free homemade food items and baking lessons for those who want to learn to bake bread, our own brownies or pies. In this wilderness setting we can also offer advice about shopping, safety, boat rentals and other activities. There’s not a guest laundry so we keep your swim, kitchen & bath towels clean during your stay too. We strive to make every getaway memorable & unique while not interfering with family fun & celebrations. Below are some of our guest's favorite things to do here: Tube, Waterski Wakeboard & Swim on the lake where the water is beautiful and clean. Relax off the dock where there’s both sun & shade for swimmers and relaxers. Eat, sleep, read, fish! Game night in the Lodge – TCL has some games or bring your favorites. Bring your Discs & enjoy our 9 Hole Disc Golf Course. Make and eat homemade ice cream! Watch the hummingbirds, phoebes, bluebirds, orioles, indigo buntings, nuthatches, turkey, osprey, herons, hawks or an occasional eagle. Bring your bikes for riding between the Meadow House or Barn at TCL and Lodge. Go to the next section for more things to do! The previous section included a list of guests’ favorite activities – continued here: Boat on this beautiful, clean and sparsely populated Lake – 1,000 miles of shoreline. Pack a picnic, find a nice cove, jump in the lake for a swim or play keep away. Nap or read in the boat with no one else in sight. Enjoy a baking lesson and learn to make Lulu’s homemade bread, pies or other goodies. Read a book from home or one of the magazines or books we have available for our guests and sign the TCL Treehouse Reading Wall of Fame! Float the icy cold White River and fish for trout. Have a horseshoes or washers tournament. Have a bonfire, (weather permitting) and bring your guitars! (Our county sometimes proclaims a “burn ban” if the weather is dry. This protects the forests that surround Trimble Creek Lodge.) Float the Buffalo River and see why this is popular with outdoors enthusiasts. Travel to the original Bass Pro Shop, Springfield, MO – the outdoor enthusiasts and fishermen & women will thank you! Explore Branson shows, shopping, & entertainment like Silver Dollar City, Dixie Stampede zip-lines through the woods and more. Visit the world-class Crystal Bridges Museum of American Art in Bentonville, AR, set in a beautiful natural location. Visit the Farmers Market, Antique stores, churches or other community events in Harrison, AR, 45 minutes from Trimble Creek Lodge. Build your own vacation memories and tell us so we can add them to this list! Bathrooms in each of the 3 cottages have both tubs and showers. The 4th bathroom, in the Lodge, has a large clawfoot tub, but no shower. Nice quality, ironed sheets. Plenty of kitchen towels & soaps. English & American soaps, lotions and shampoos and plenty of towels in bathrooms. Extra swim towels also available. Resort washer available during designated hours for guest use. Lots of towels provided and we launder them for you! Dishwasher in the East Cottage where most families prepare their common meals. (4) Two in the East Cottage. 1 each in the Meadow House and Barn at TCL. Guests tell us there is so much more here than at other places they have stayed! Each of the 3 cottages has kitchen table & chairs. In addition, 2 dining room tables in the Lodge provide ample seating for Larger family gatherings & space for board games or other family fun. (3) 1 flatscreen TV each in the East Cottage, Meadow House & Barn at TCL. All are Satellite TV. Lulu collects books. We have a wall full of them for you to read during your getaway here . Vintage Brunswick pool table for adults or supervised older teens. One 2-person (225 pounds) Kayak and one youth (130 pounds or less) kayak as well as 2 stand up paddle boards are available for no charge if returned clean with paddles intact. One Jon boat - you bring the motor or use our paddles - available for no charge if returned clean with paddles intact. (6) Natural Views from all Porches & Patios. You might see deer or turkey but you won’t see other houses or people (other than your Innkeepers) while you are here. Plenty of Outdoor Seating for Meals and Celebrations. Lake View Patio with Grills Outside East Quarters, Lake View Deck Behind Lodge Window Wall, Lighted Porch West of Lodge, Covered & Lighted Porch with Fridge Near Horseshoe Pits & Treehouse, Covered Lodge Front Porch with Garden Views, Covered Back Porch with Outdoor Ceiling Fans & Meadow View Behind Meadow House. Disc Golf that is! 9 hole Course on our property added in 2015! Located in a gorgeous wilderness setting, our rock lined path to the dock as well as uneven (& beautiful) outdoor spaces are not suitable for wheelchairs or those with an unsteady gait. Active walkers and those who enjoy disc golf, wakeboarding, skiing, tubing and other summer water fun find our place perfect for families. Bull Shoals lake is not crowded, even during holidays - there is always an open cove for your relaxation and privacy on the lake. Our dock is for our guests only & many families enjoy swimming & kayaking off and around our dock that is located in a beautiful cove. Smoking and vaping allowed in designated outdoor locations. Absolutely no indoor or vaping smoking allowed. The family enjoyed swimming off the dock, some fishing, and boating (paddle boat, etc.). We enjoyed making home made ice cream, bread and eating home made apple pie. Beautiful view and great place to stay. We so enjoyed this family of little ones through grandparents! Hanging out at the dock, and enjoying the water, this bunch had great fun just relaxing in our fantastic location at the end of the Trimble Creek cove. Come back again! Perfect calm lake for boating, skiing and floating. This is our second year staying at the beautiful Trimble Creek Lodge. Our accommodations were spotless both times, you won’t find a kitchen better stocked. Views of spring flowers blooming around us, song beds, turkeys, deer in the meadows and Bull Shoals Lake . We can’t say enough about our hosts, Michael and LuLu. They are so much fun and go beyond any 5 star establishment we have stayed at. We have enjoyed homemade ice cream, their famous brownies, new this year- Julie’s Barefoot Apple Pie (Named after a guest who locked her and her husband out of the cabin at midnight to look at a storm-then walked about a half mile to the lodge to get a key With no shoes), chuckling.... yes it was me. We are still laughing about this. It’s a great place to stay and everything is SO well done. We commend our hosts and would highly recommend Trimble Creek Lodge. We hope your stay is as enjoyable as ours has been the last 2 years. We spent the last week in paradise. We are thrilled when our boating guests enjoy our dock and swimming area as much as we do! It's hard to describe the beauty of this lake if you've not been here and we are very glad this wonderful family enjoyed their stay here with us in the Natural State. We understand the blog and new website are almost set and we'll make certain these guests' favorite treats from Trimble Creek Lodge get posted! We all loved our stay at Trimble Creek Lodge. It's a perfect setting for a relaxed group gathering like our family reunion. Lulu and Michael were the perfect hosts, and Lulu's bread was out of this world. Everyone commented on how comfortable the beds were. Offering a little pampering and our special breads and desserts is something we enjoy and we are so happy this wonderful family had a great getaway here with us on beautiful Bull Shoals Lake! Wonderful experience! Michael & Lorilee are incredible hosts! They are there when you need them, respectful of your privacy. Upscale rustic accommodations, I can't stress enough how clean everything is, feels like home. Beautiful property, with gorgeous view of the lake from the lodge. Bull Shoals Lake is clean. Enjoyed paddle boarding, kayaking, paddle boating & tubing on the lake. Will recommend to friends & family. 2016 is our first year with stand up paddle boards and kayaks available for our guests and we are so happy to see they have been a big hit with many of our groups who enjoy hanging out on our dock and on Bull Shoals Lake. We also work very hard here to make sure everything is sparking clean for every guest - this is important to us personally when we travel and we make sure our place is the way we would want it ourselves were we the Trimble Creek Lodge guests. We are glad when other clean-loving travelers appreciate our special efforts! Summer reunions & groups reserve the entire resort. Trimble Creek Lodge is a cross between a Resort, a Vacation Home and a Country Inn, located on a lovely 72 acre peninsula of Bull Shoals Lake in a secluded, wilderness location. You will find plenty of extras like great beds, fresh flowers, great sheets and home-made desserts but you can cook for yourselves in our well equipped kitchens. One reason our place is great for reunions is our Lodge Common Space – an airy room with cathedral ceilings and plank oak floors overlooking the lake where you can gather day or night for games, conversations, or meals. This is a great lake for fishing, boating, waterskiing, tubing and other family water fun. The mile-long cove where our private dock is situated is not crowded and perfect for family water sports - you can always find a secluded cove to teach your kids to ski. A 9 hole Disc Golf Course on Trimble Creek Lodge Property is for our guests only, located in a lovely area between our Meadow House and Lodge. Within an hour’s drive find Golf courses, Zip lines, Silver Dollar City, Branson, MO, White & Buffalo Rivers. Visit the town of Eureka Springs (1.5 hours) for upscale shopping and fabulous Victorian architecture. The Crystal Bridges Museum in Bentonville offers first-class American art in a fabulous natural setting just 90 miles from Trimble Creek Lodge. We offer many extras for all our groups. Call 870-436-3222(landline) or 870-221-3475 (cell) for more details. Summer 2019 Minimum Rates start at $2925 for 10 or fewer guests + fees for additional guests, & cleaning fees -14 max.